As we've discussed before here, FinTech is booming. Startups enabling services like peer to peer money transfers, lending services and online payments are on the rise, as shown by these graphs from CB Insights. The first shows the amount of funding FinTech startups have received over the past 5 years. Investments in Q2 2010 made up less than $1 billion, in Q1 2015 they’ve risen to nearly $3 billion as the FinTech landscape consistently grows in size and value. FinTech is, without doubt, a booming sector. The last 12 months have seen almost $14 billion of funding and, when we look at the quarterly trend, you see there is a very steady rise in both funding and deal activity. Indeed, the data suggests this is a healthy, sustained growth in investments in emerging private companies. Even more fascinating is the increase in the number of investors in FinTech over the past 5 years. There are four times as many FinTech investors now than in 2010. That’s some serious traction. Note that this graph only accounts for venture capital investors, not angel investors or accelerators. But where are the investments being focused? 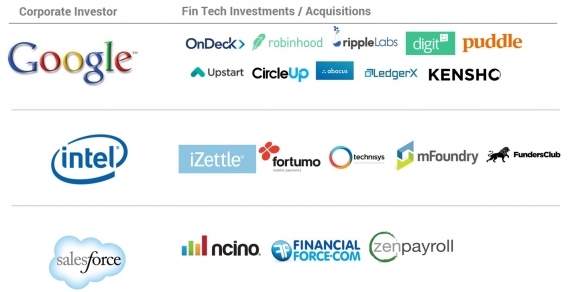 Payments are a key area for FinTech investors. In December 2014, for example, we saw leading payments innovator Adyen secure a $250 million Series B funding round to expand its international payment platform. This funding round saw the young Dutch company valued at $1.5 billion after doubling its transaction volume revenue over the course of 2014. Adyen are just one of a number of companies helping us to manage our money more efficiently, whether that's with new technologies or disruptive business models. Peer-to-peer lending has seen several major investments, while Bitcoin - and the blockchain technology its based on - is also popular with VC investors. What's really interesting about this wave of FinTech investment are the number of unusual suspects getting involved. Away from the top tier venture capital firms, non-financial companies like Google, Intel and Salesforce are seeking to get in on the FinTech action. Google, for example, has completed 37 FinTech investment deals in the last 5 years through its venture capital wing, Google Ventures. The arrival of such companies in the FinTech space hints at the huge potential of the sector as a whole. It's often assumed that the FinTech investment boom is being fuelled by financial services players seeking to get ahead of their competitors, causing an escalation of investment in startups promising technological innovation. In fact, the FinTech sector is giving non-financial companies a route into the highly competitive financial services market. All in all, the uplift in FinTech investment is a perfect illustration of the movement towards customer centric, transparent and fairer finance. A movement Symbid is proud to be a part of.